Technologies and Products by Magneti Marelli entered into the realm of the two major American events at the beginning of this year, the NAIAS (North American International Auto Show) in Detroit and the CES (Consumer Electronics Show) in Las Vegas. There are, in fact, many cars displayed at NAIAS Detroit in which Magneti Marelli technological solutions are adopted. 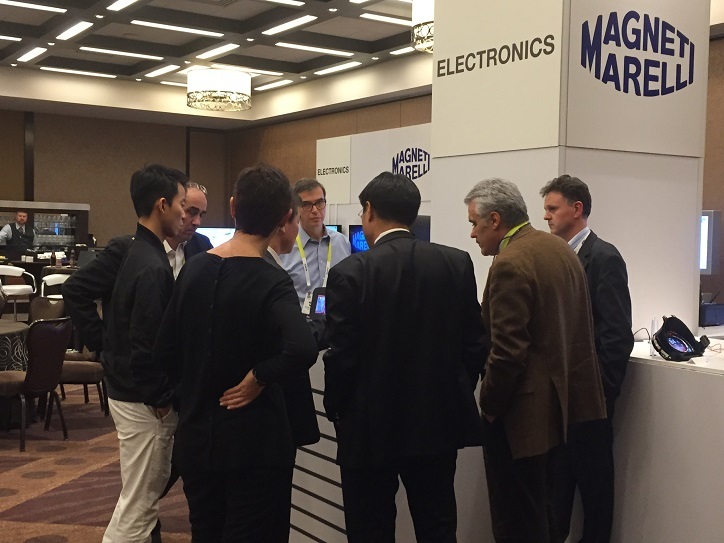 At a CES off-site demo event staged in Las Vegas, Magneti Marelli also showed advanced technologies for infotainment, telematics and display including the latest developments in lighting and powertrain. Regarding the North American International Auto Show (NAIAS) 2015 scheduled from 12th to 25th January, the headlamps supplied by Magneti Marelli Automotive Lighting for the top models of Mercedes-Benz excelled. This was most notable in the world premiere of the new GLE Coupé with latest generation LED lights, alongside the LED headlamps for the C450 AMG Sport and the C350 Plug-in Hybrid. In addition, Front LED headlamps for the restyling of the BMW 6 Series (Convertible, Coupe and Gran Coupé) were presented in a world premiere. Rounding out the show offering, LED headlights on the Audi Q7 in addition to the LED projectors and headlights for the Chevrolet Volt, Xenon headlamps for the Cadillac CTS-V and for the Buick Cascade were introduced to the public. In regards to infotainment, the BMW 6 Series has adopted the Business navigation system with high-resolution maps and 3D elements and animations, and faster route calculation speed. The BMW infotainment system uses the Magneti Marelli open platform to enable a wide range of applications of on-board vehicle telematics and connectivity. This was also the North American début for the Magneti Marelli infotainment multimedia system for the Mini based on a concept of "open source" technology. The system offers an innovative series of features, including navigation, brilliant graphics, Internet access and wireless connectivity, which until now was not available in the entry-level systems. Concerning instrument panels, Magneti Marelli is providing an instrument cluster with traditional five-element circular design for the Porsche 911 Targa 4 GTS that collects all pertinent information useful for the driver. Within the instrument panel there is a reconfigurable TFT 4.6" display that summarizes the information related to navigation and infotainment functions and incorporates an amplified speaker. Several other Magneti Marelli technologies made their North American premiere for the new Alfa Romeo 4C Spider, equipped with Xenon headlamps and LED circular tail lights that distinctly define the aesthetics and decisively and elegantly re-propose the typical Alfa Romeo design. Another prominent component is the exhaust terminal that is key for the sound of the car. In this case, Magneti Marelli collaborated with Alfa Romeo using specific technologies that are able to define the sound of the car, which is consistent with the sporty image that characterises it. Magneti Marelli technology is also used within the car’s shock absorbers and, within its Powertrain, in its ECU (Electronic Control Unit) and in the electro-hydraulic actuators of its Dual Clutch transmission. As for the Jeep brand, a Mopar version of the new Renegade was presented in Detroit. The standard model adopts the new instrument panel developed by Magneti Marelli, which integrates several vehicle and infotainment functions in the display. Magneti Marelli lighting systems, powertrain components, electronic systems, suspension systems and shock absorbers are also represented on the Jeep Renegade - with plastic components and exhaust systems rounding out Magneti Marelli’s features in the car. One of the main innovations shown at NAIAS is the Fiat 500X, the new Fiat crossover that adopts several Magneti Marelli technologies: the instrument panel, the front lighting with halogen headlamps and, optionally, with 25-Watt Xenon headlamps. The 25-Watt headlamp, compared to the traditional 35-Watt system, enables lower energy consumption whilst ensuring excellent visibility. Of interest are Magneti Marelli's electronic engine control unit, motorised throttle, intake manifolds and PFI injectors for the 1.4 Multiair gasoline engine, and motorised throttle with several intake manifolds for the 2.4 gasoline Tigershark engine plus shock absorbers, exhaust and suspension systems. In addition to the technologies already present in the previous version of the Fiat 500 (lighting systems, powertrain, electronics, exhaust and suspension systems), debuting for the American market is the revamped instrument panel with TFT 7" digital display, developed in collaboration with Magneti Marelli, which provides all the useful information to the driver, including but not limited to as the data provided by the tachometer, rev counter and trip computer. Magneti Marelli also presented new Electronics, Lighting and Powertrain technologies for the occasion of the International Consumer Electronics Show (CES) in Las Vegas, the largest consumer electronics events in the world. The most advanced technologies in these areas were exhibited during an exclusive off-site exhibition held at the Cosmopolitan Hotel in Las Vegas. Magneti Marelli placed the focus on infotainment, telematics and displays, presenting a selection of latest generation instrument panels with AMOLED technology, which are characterised by reduction of power consumption, greater display speed and very sharp colours with a more defined contrast. The advanced GENIVI platform infotainment and navigation systems (Automotive Linux) were also exhibited as well as a large screen connected infotainment concept presenting Magneti Marelli’s vision of a fully customizable and connected infotainment system with a large touch display user interface. The most advanced frontier technology was also illustrated in terms of automotive lighting know-how: from new laser technologies, where a phosphorus converter transforms the laser beam into white light, producing the ideal conditions for the human eye, to a light matrix where the light beam is controlled and directed adaptively and electronically. To complement the exhibition, in terms of powertrain technologies, Magneti Marelli exhibited the latest solutions in terms of strategic components and systems for hybrid-electric propulsion. Magneti Marelli produces advanced systems and components for the automobile industry. With 85 production units, 12 R&D centres and 26 application centres in 19 countries, more than 38,000 employees and a turnover of 6 billion Euro in 2013, the Group supplies all the major carmakers in Europe, North and South America and the Far East. The business areas include Electronic Systems, Lighting, Motor Control, Suspension Systems and Shock Absorbers, Exhaust Systems, Aftermarket Parts & Services, Plastic Components and Modules, and Motorsport. Magneti Marelli is part of FCA.